Rotisserie pineapple seems exotic, but it is easy - the only hard part is driving the spit through the core of the pineapple. Now, most people aren’t as rotisserie crazy as I am, with an extra spit lying around. That’s OK - cook it on the same spit as the main course. It will take about an hour to rotisserie a pineapple, over indirect high heat; the same time it takes for a 4 pound chicken, a beef rib roast, or a pork loin. Put the pineapple on the end of the spit, next to the roast, and you have a sweet side dish to serve with dinner. Or, save the pineapple for dessert and serve it with a scoop of vanilla ice cream. Cut the top and bottom off the pineapple. Working around the outside of the pineapple, cut the rind off in 1 inch strips, making sure you cut deep enough to remove the eyes. Once the first strip of rind is removed, you can see the eyes in the pineapple; use them as a guide for how deep to cut the rest of the way. 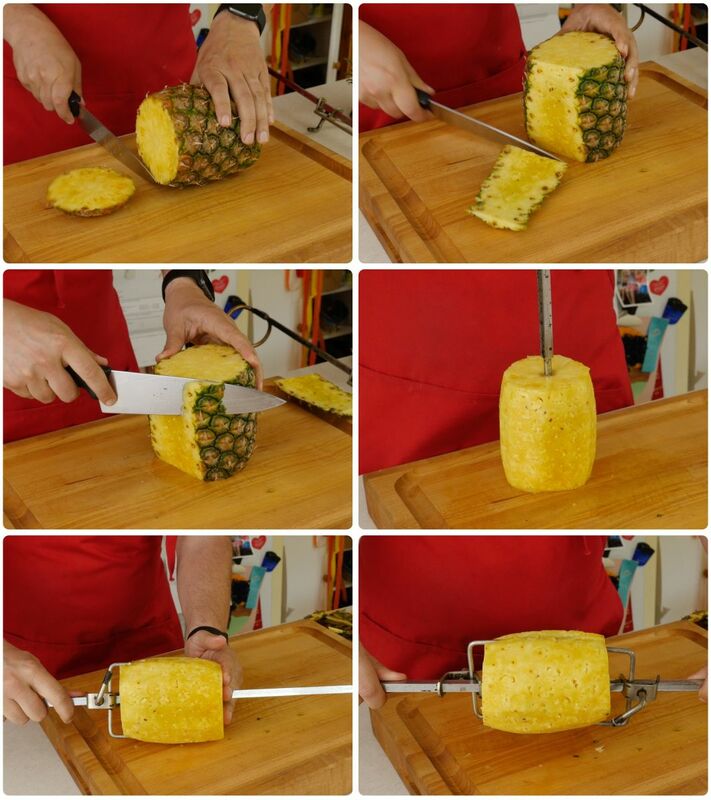 Drive the spit through the center of the pineapple, and secure the pineapple to the spit with the spit forks. Be sure to test that your food freely fits and spins on the rotisserie. It is crucial to test this out before you preheat the grill. Remove the pineapple from the rotisserie spit. Be careful - the spit and forks are blazing hot. Let the pineapple rest until it is cool enough to handle, then slice and serve. Adapted from: Rotisserie Grilling by Mike Vrobel. Visit Mike at DadCooksDinner.com.